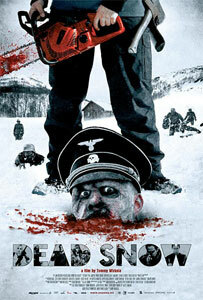 It has been a while since I saw a decent zombie romp so settling down to watch Dead Snow I was excited at the prospect of a madcap zombie gorefest. The film is about a typical group of young students on holiday who decide to stay in a remote cabin in the snow covered mountains. What they don't know is that the hills are alive with undead Nazis. This is a Norwegian film but the makers are clearly big fans of various horror classics, most notably The Evil Dead, and you'll have no trouble getting into the scenario. It starts out like a slasher flick complete with a crazy old guy to warn the kids off and develops into a blood splattered and absurd action comedy. This is pure gory, unchallenging fun.